Not to be confused with May 2014 Ürümqi attack. On 30 April 2014, a knife attack and bombing occurred in the Chinese city of Ürümqi, Xinjiang. The incident, a terrorist attack, left three people dead and seventy-nine others injured. The attack coincided with the conclusion of a visit by Xi Jinping, General Secretary of the Communist Party of China to the region. At approximately 7:10 pm local time, a pair of assailants attacked passengers with knives and detonated explosives at the city's railway station. Police closed off all entrances to the station in the immediate aftermath of the attack, but it was reopened at 9 PM with increased security. It is not known how many individuals were involved in the attack, but two individuals are suspected. The Turkestan Islamic Party claimed the responsibility of the attack. The attack occurred on the final day of Xi Jinping's four-day tour of the region. He had, only the day before, labelled Xinjiang as the "front line against terrorism" during a visit to the nearby city of Kashgar, and vowed to take a hardline against terrorism and violence attributed to Muslim Uyghur separatists, which claimed the lives of at least one hundred people over the past year. It is not known if Xi was still in the province when the attack took place. On the morning of the attack, he visited a mosque – located 2 kilometres (1.2 mi) away from the railway station – and urged religious leaders to foster harmony among the people in Xinjiang by giving followers a better understanding of religious teachings. The blast damaged the billboard located southwest of the South Railway Station. After the South Railway Station blast, security checkpoints were constructed on the square in front of the South Railway Station after May 26. This image shows the No.1 security checkpoint at South Railway Station. At 7:10 pm local time on 30 April 2014, a group of individuals used knives to attack passengers and detonated bombs at the exit of Ürümqi South Station. 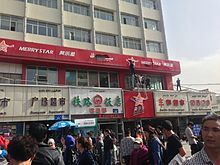 Originally, it was thought that the explosives came from luggage situated between the station and the bus stop outside, but the People's Daily stated that the attackers had "set off bombs tied on their bodies and died." The scope of the blast was also disputed. While one worker at a nearby hostel had reportedly mistaken the explosion for an earthquake, another eyewitness noted how the bomb appeared to be "home made, as the blast was not massive." Initially, the attack was said to have injured fifty people, but state news media revised the figures the next morning to three killed and seventy-nine injured. It was reported that the attack was carried out by two religiously motivated suicide bombers. One of them was identified as a 39-year-old from the southern Xinjiang city of Aksu. According to an anti-terrorist intelligence service, a group named Turkestan Islamic Party has claimed responsibility for the attack. After the attack, "security forces moved quickly" to the station, and later paramilitary and riot police were stationed on its various entrances. Casualties were taken to the hospital in ambulances, but taxis were also commandeered to compensate for a lack of ambulance availability and to ensure the swift treatment of injuries. According to Xinhua News Agency, the area around the station was evacuated by security forces. The bombing meant that the rail services ceased for about two hours, and ensuing this attack nearby shops repaired minor damage and tightened security. There was an overnight cordon around the train station, which was lifted at 9:00 PM, amid heavier police security. Many internet posts regarding the attack were rapidly censored by the Chinese government. Sina Weibo, the country's largest microblogging site, took down comments and photos pertaining to the explosion, which had come through within an hour on their "Breaking News" account. It did not make any further updates for two hours. Communist Party general secretary Xi Jinping responded to the incident by promising "decisive actions [against] terrorist attacks", and stated that a “strike-first” strategy would be implemented. He also called on government officials in the region to do everything they could to ensure that the injured were assisted, the crime investigated and the perpetrators punished severely. Search engine Baidu prevented certain results from appearing when searching for terms related to the attack – citing "relevant legal rules and policies" – while Chinese news media simply duplicated the report by Xinhua News Agency, which is required of them when reporting on sensitive topics. ^ a b c d "Deadly China blast at Xinjiang railway station". BBC News. BBC. 30 April 2014. Retrieved 1 May 2014. ^ urumqi wogzaldiki partiltix jihadi uyghur mujahid turkistan. Mustafa Turkistani. May 7, 2014. ^ a b c d e Forsythe, Michael (30 April 2014). "Assailants Attack Train Station in Restive Western China". The New York Times. Retrieved 1 May 2014. ^ a b c d e "Extremists 'bombed China station'". MSN. 1 May 2014. Retrieved 1 May 2014. ^ a b "Turkestan Islamic Party claims Chinese railway station attack". IANS. news.biharprabha.com. Retrieved 15 May 2014. ^ Wen, Philip (1 May 2014). "Fatal bomb and knife attack at China's Xinjiang railway station". The Sydney Morning Herald. Retrieved 1 May 2014. ^ a b Beech, Hannah (30 April 2014). "In China, Deadly Bomb and Knife Attack Rocks Xinjiang Capital". Time. Retrieved 1 May 2014. ^ Makinen, Julie (30 April 2014). "Blast hits Chinese city in region visited by Xi; 3 reported dead". Los Angeles Times. Retrieved 2 May 2014. ^ a b "Xinjiang station attack: President Xi Jinping urges action". BBC News. BBC. 1 May 2014. Retrieved 1 May 2014. ^ Phillips, Tom (30 April 2014). "Explosion in China railway during presidential visit kills three". The Daily Telegraph. Retrieved 1 May 2014. ^ Chen, Andrea (1 May 2014). "Breaking news alerts on Urumqi attack 'censored' on Weibo". South China Morning Post. Retrieved 1 May 2014. ^ a b Tatlow, Didi Kirsten (1 May 2014). "Online, a Censored Reaction to Urumqi Bombing". The New York Times. Retrieved 1 May 2014.